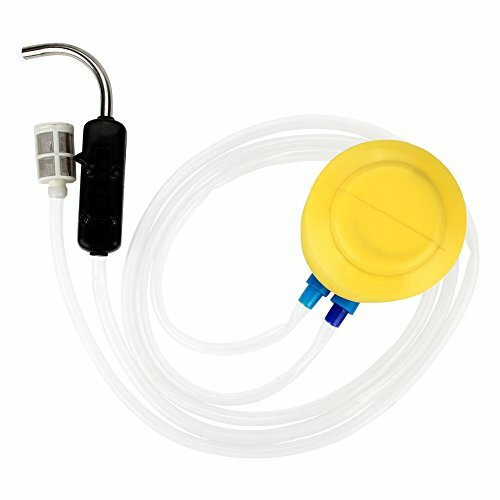 Easy to use: Just put the filter valve into the water and squeeze the pump repeatedly. Simple operation, no need charging, environmentally-friendly. Exquisite workmanship, from the soft tube to filter valve, from the pressure to the stainless steel water outflowing mouth, both features excellent durability. The textured plastic handle is anti-skid and comfortable for grip, not easy to drop away. The pump has strong suction force and contributes to your water changing efficiency. Lightweight and practical to carry outdoor, perfect for watering the fish box, fish barrel or wash hand or other purposes. Easy to use: Just put the filter valve into water and squeeze the air bag repeatedly. Simple operation, no need charging, environmentally-friendly. Exquisite workmanship, from the soft tube to filter valve, from the pressure air bag to the stainless steel water outflowing mouth, both features excellent durability. Textured plastic handle is anti-skid and comfortable for grip, not easy to drop away. The pump has strong suction force, and contributes to your water changing efficiency. If you have any questions about this product by Dioche, contact us by completing and submitting the form below. If you are looking for a specif part number, please include it with your message.